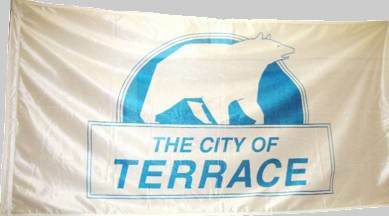 The City of Terrace, British Columbia (population: 11,320) is located in the NW of the province. The geography of the local area consists of a series of natural flat benches or terraces along the Skeena River Valley. The bear is a Kermode/Kermodei. The Kermodei is actually a subspecies of Black Bear, where about 20% of the bears are white. The animal is now recognized as a symbol of British Columbia, and Terrace considers itself the home of the Kermodei. Lately, the bear has been referred to as the Ghost Bear, and from that it became the Spirit Bear. The Kermode bear is a genetically-unique subspecies of black bear found in the central coast of British Columbia. Kermodes are noted for the appearance in their gene pool of a recessive trait that gives a small percentage of their population white or cream-coloured coats. The white bears are known as spirit bears and have a place in the native mythology of the area. The Kermode subspecies ranges from Princess Royal Island to Prince Rupert Island on the coast, and inland toward Hazelton, British Columbia. It is named after Francis Kermode, a naturalist and museum curator. The Latin name of the white black bear is Ursus americanus kermodei.